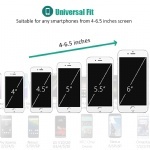 [Universal Compatibility]: Perfectly fits iPhone XS Max/ XS/ XR/ X/8 Plus/8/7 Plus/7/6S Plus/6s, Samsung Galaxy Note 9/S9 Plus/S9/S8 Plus/ S8/ S7 edge, and all 4"-6.5" screen smart phones. Suitable to use with thin protective case too. [360° Rotatable]: 360°rotation makes it stand out from those similar products in market. You can freely adjust angle to the most suitable viewing position with this wristband that sits snugly on your wrist. 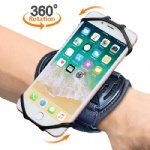 [Full Access & Hands Free]: Open-face feature lets you easliy access to all buttons and screen; Stretchy silicone holder secures the phone to your wrist, free your hands without holding phone in hand when running. [Comfortable Fit]: Made of high-quality breathable Lycra and Neoprene, this wristband provides odor-free, soft and skin-friendly wearing experience; Highly elastic and adjustable Velcro strap fits for most different size of wrists. 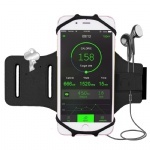 [Ideal Sports Companion]: Whether you love staying outdoors or indoors, you can use the armband for walking, running, cycling, hiking, climbing, fishing and doing household chores like cooking, mowing or cleaning.